Frog Dissection is an excellent and very user-friendly iPad app that helps you learn more about the internal anatomy of the frog, without the need to actually dissect one! Frog Dissection allows you to dissect a mock chloroformed specimen complete with dissection instruments-pins, scalpel, marker, and forceps. 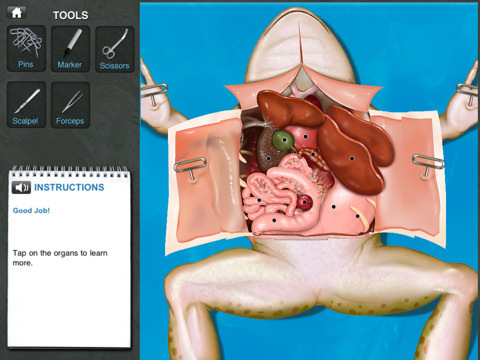 The app provides step-by-step instructions for the dissection and incorporates some excellent 3D imaginery of the frog's internal organs. The app looks incredibly realistic and anatomincally acurate. There is also a section on frog classification and life-cycle, detail on organ function and anatomical comparisons of human body with the frog body explaining the similarities and differences between the two. Click here to visit their website for more information on the app. Definitely worth a purchase at only €3.99. Click here to visit the app store.